The exponential growth of the volume of data generated by users, systems and sensors, further accelerated by the concentration of large part of this volume on big distributed systems like Amazon, Google and other cloud services. The increasing interdependency and complexity of data, accelerated by the Internet, Web2.0, social networks and open and standardized access to data sources from a large number of different systems. The relational databases have increasing problems to cope with these trends. This has led to a number of different technologies targeting special aspects of these problems, which can be used together or alternatively to the existing RDBMS - also know as Polyglot Persistence. Alternative databases are nothing new, they have been around for a long time in the form of e.g. Object Databases (OODBMS), Hierarchical Databases (e.g. LDAP) and many more. But during the last few years a large number of new projects have been started which together are known under the name NOSQL-databases. This article aims to give an overview of the position of Graph Databases in the NOSQL-movement. The second part is an introduction to Neo4j, a Java-based Graph Database. NOSQL (Not Only SQL) really is a very wide category for a group of persistence solutions which don't follow the relational data model, and who don't use SQL as the query language. For Key/Value systems like Voldemort or Tokyo Cabinet the smallest modeling unit is the key-value-pair. With BigTable - clones it is tuples with variable numbers of attributes, with document databases like CouchDB and MongoDB the document. Graph Databases model the whole dataset as one big dense network structure. 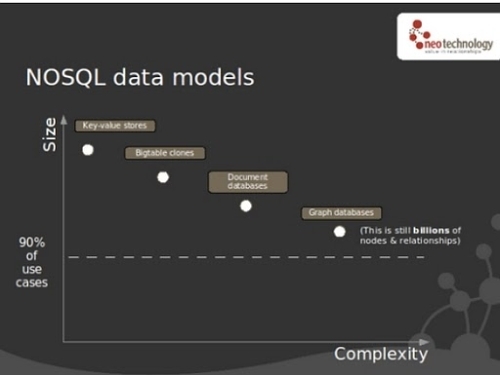 Here, two interesting aspects of NOSQL databases will be examined deeper - Scalability and complexity. Partition-tolerance: the total system keeps its characteristic even when being deployed on different servers, transparent to the client. The CAP-Theorem postulates that only two of the three different aspects of scaling out are can be achieved fully at the same time. In order to be able to work with big distributed systems, a closer look on the different CAP cahracteristics was taken. Many of the NOSQL databases above all have loosened up the requirements on Consistency in order to achieve better Availability and Partitioning. This resulted in systems know as BASE (Basically Available, Soft-state, Eventually consistent). These have no transactions in the classical sense and introduce constraints on the data model to enable better partition schemes (like the Dynamo system etc). A more comprehensive discussion of CAP, ACID and BASE is available in this introduction. Before dismissing the relational data model as outdated, we should not forget that one of the reasons for the success of the relational databases systems is the ability of the relational Datenmodell according to E.F. Codd to model in principle any data structure without redundancy or information loss through - normalization. After the modeling phase, the data can be inserted, modified and queried in very powerful ways via SQL. There are even RDBMS that implement optimized schemas for e.g. insertion speeds or multidimensional queries (e.g. star schemas) for different use cases such as OLTP, OLAP, web-applications or reporting). This is the theory. In praxis however, RDBMS hit the constraints of the before-mentioned CAP-problems and have implementation-caused problems regarding high-performance querying of "deep" SQL queries that span many table joins. Other problems include scalability, schema evolution over time, modeling of tree structures, semi strucutred data, hierarchies and networks and many more. Also, the relational model is poorly aligned with the current approaches to software development like object-orientation and dynamic languages, known as the object-relational impedance mismatch. Here, ORM layers like Hibernate for Java have been developed and applied with mixed results. They certainly ease the task of mapping the object model to the relational data model, but do not deliver optimal query performance. Especially semi-structured data is often modeled as big tables with many columns that are empty for most rows (sparse tables) which leads to poor performance. Even the alternative, to model these structures in lots of joined tables, is having problems, since joins are very performance-expensive set operations in RDBMS. Looking at the projection of domain models onto a data structure, there are two dominating schools - the relational way as used for RDBMS and graph- und network structures, used for e.g. the Semantic Web. While graph structures in theory are normalizable even in RDBMS, this has serious query performance implications for recursive structures like for instance file trees and network structures like e.g. social graphs, due to the implementation characteristics of relational databases. Every operation over a relationship of a network results in a "join" operation in the RDBMS, implemented as a set-operation between the sets of primary keys for two tables - a slow operation and not scalable over growing numbers of tuples in these tables. More specifically, the model is a labeled and directed attributed multigraph. A labeled graph has a label for each edge, that it is used as the type for that edge. A directed graph allows for edges with a fixed direction, from the tail or source node to the head or destination node. An attributed graph allows a variable list of attributes for each node and edge, where an attribute is a value associated to a name, simplifying the graph structure. A multigraph allows multiple edges between two nodes. This means that two nodes can be connected several times by different edges, even if two edges have the same tail, head and label. 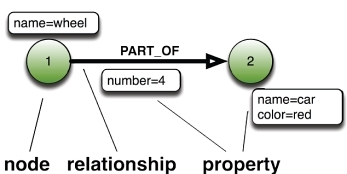 The figure shows a small labeled property graph. Others like InfoGrid, Filament, FlockDB etc. The following diagram shows a positioning of the main NOSQL categories in the context of Complexity and Scalability aspects. For more on "Scaling to size vs. 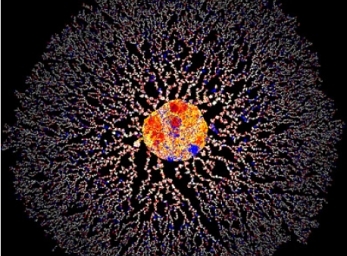 Scaling to Complexity" see Emil Eifrem's blog post. Easy modeling of normally complex domain data sets, e.g. Access control modeling in CMS as fine grained Access Control Lists, Object-Database like use cases, TripleStores, and many more. Typical use cases in areas like Semantic Web and RDF, LinkedData, GIS, Genome analysis, modeling of social network data, deep recommendation algorithms and many more. Even "traditional" RDBMS applications tend to contain a number of challenging data sets that is best processed with graphs, like folder structures, product configurations, product assemblies and categories, media-meta data, semantic trading and fraud detection in the financial sector and others. Neo4j has a number of optional components surrounding the kernel. There is support for structuring the graph via a meta model, a SAIL- and SparQL compliant RDF TripleStore implementiation or implementations for a number of common graph algorithms amongst others. In case you want to run Neo4j as a separate server, there are is the REST- wrapper available. This is suitable in architectures that have been built using the LAMP - stack. REST even eases the scaling of bigger read-loads via memcached, e-tag and Apache-based caching and web layers. It's hard to give definite numbers in performance benchmarks, since they are very dependent on the underlying hardware, the dataset used and other factors. Size-wise Neo4j handles graphs of sizes of several billion nodes, relationships and properties out of the box. It is normal to reach read-performance of 2000 relationship traversals per millisecond (about 1-2 million traversal steps per second) fully transactional, with warm caches, per thread. With shortest-path-calculations, Neo4j is even on small graphs of a couple of 1000 of nodes 1000 times faster than MySQL, the difference increasing as the size of the graph increases. The reason for this is that in Neo4j, graph traversals are exectued with constant speed independent of total size of the graph. There are no set operations involved that decrease performance as seen with join operations in RDBMS. Neo4j is traversing the graph in a lazy fashion - nodes and relations are first traversed and returned when the result iterator is asking for them, increasing performance with big and deep traversals. Write speed is much dependent on the seek time of the file system and hardware. The Ext3-filesystem and SSD disks are a good combination and result in transactional write speeds of ca. 100,000 operations per second. The graph is connected to a known reference node (id=0) for convenience in order to find the way into the network from a known starting point. This is not necessary, but has proven very usable in practice. Create a new graph database in folder "target/neo"
to create the nodes and relationships. We first want to visit all nodes at the same depth from the start node before continuing to nodes at more distant levels (Order.BREADTH_FIRST), stop after one depth of traversal (StopEvaluator.DEPTH_ONE), and return all nodes except the start node ("Neo") (ReturnableEvaluator.ALL_BUT_START_NODE). We only traverse relationships of type KNOWS in both directions (Direction.BOTH). 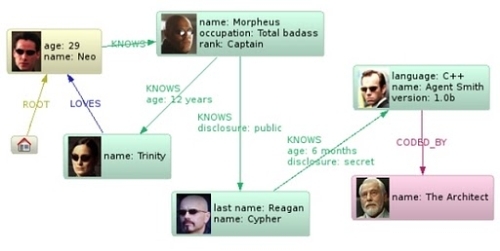 This traverser again returns Morpheus as the only direct friend of Neo. Which returns Cypher and Trinity as result. Another interesting question could be if there is anyone in this graph being in love, starting with e.g. The Architect. This returns Trinity as the only node, since we are only returning nodes with outgoing LOVE-relationships. While traversing operations along the relationships are one of the sweet spots of Neo4j, often set-oriented functionality over the whole graph is needed. Fulltext-search of properties over all nodes is a typical example. Here, Neo4j is using external index systems in order not to reinvent the wheel. For the common case of text-based searches, Neo4j has tight integrations for Lucene and Solr, adding the capability to index arbitrary node properties with transactional semantics in Lucene/Solr. Lucene is an example of an external index to the graph. However, having a fast graph engine, that are a vast number of strategies to build index structures in the graph itself, shortening traversal patterns for special data sets and domains. For instance there are timeline and B-Trees for one-dimensional data, RTrees and QuadTrees indexing two-dimensional data (very common in the Spatial and GIS communities) and many others. Often another useful pattern is to connect important subgraphs directly to the root node in order to shortcut important start-nodes. Java sux. Anything shorter, please? Until recently, there has not been any query language that covered the large domain of graphs and graph-related projects. In the Semantic Web/RDF domain, there is SPARQL, an SQL-inspired query language that focuses on the description of example graphs that are use to match triple sets. However, there is a large amount of graphs that are not RDF-compatible and take different or more pragmatic approaches to data modeling like for instance the Matrix-example of this article and other domain-specific data sets. Other query language are JSON-oriented, like MQL, the query language for Freebase. These languages only work on their own defined data model and provide none or very poor support for deep graph algorithms and heuristic analytics methods, that are necessary for todays big graphs. 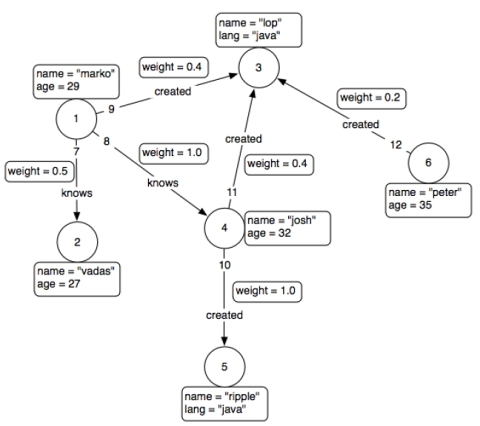 For more complex and interesting queries for various graph data models (including RDF), Gremlin - an XPath-oriented, turing-complete graph programming language - is being developed by the TinkerPop team, primarily driven by Marko A. Rodriguez. Via the introduction of the Property Graph Model, it creates a superset and least common dominator for most of the existing models. Moreover, it allows for the connection of other graph frameworks (e.g. Gremlin using JUNG) and for the expression of graph traversals on different graph implementations. 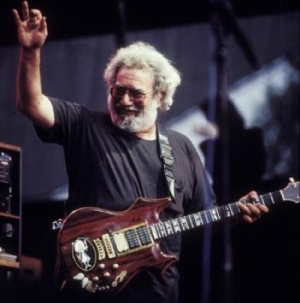 There are already a couple of implementations supported, from simple ones like the in-memory TinkerGraph, to others via an RDF-SAIL-adapter for AllegroGraph, Sesame and the ThinkerPop LinkedData SAIL (originally developed by Josh Shinavier for the Ripple programming language) all the way to Neo4j. Gremlin's syntax is based on XPath in order to be able to express even deep path descriptions through the graph with easy expressions. Many easy cases look almost like normal XPath. Another interesting example where the underlying graph is the LinkedData graph live from the Internet is a recommendation algorithm for music over LinkedData and DBPedia. Graphs are not the silver bullet for all problems, much like RDBMS and all other persistence solutions. The most important aspect is the data, it's and the type of queries and operations structure that is to be dealt with, and what requirements exist regarding scalability and CAP. To take the High Scalability aspect of NOSQL databases as the only argument for the use of non-relational solutions is often neither required nor desirable. With Neo4j and todays hardware, it is in most cases with whole domain model can be held and queried within billions on domain objects in one single instance. If that is not sufficient, there is always the possibility to introduce domain-optimal sharding concepts without the need to introduce the hard data modeling limitations of documents or key/value systems. Whether this results in a dokumenten-model, a domain specific "object database" or something else depends on the domain context and the application scenario. For the excellent feedback and the helpful advise I want to thank Michael Hunger and Marko Rodriguez. Peter Neubauer is COO of Neo Technology. Peter is co-founder of a number of Java-and graph based Open Source projects like Neo4j, Gremlin, LinkedProcess, OPS4J, Qi4j. Peter can be contacted at peter@neotechnology.com. All very good but ? DEX a High Performance graph database. VertexDB a nice approach using a key-value as an storage or DirectEdge a powerfull graph based recomendation engine. Does any off these have business friendly license ? I was looking for something like this for ages. Most discussions were focused on the theoretical aspects or on the differences between graph vs. relational worlds. It is good to know too that not always a map/reduce implementation is the solution to the Giga data traversing problem. Are there any tests/reports that confirm the constant traversing speed? Thank you Pere for the link. You’ve succinctly articulated the value of persistent storage technologies like Graph and Object Databases, which employ semi-static relationship binding. Semi-Static in that the relationships are bound into the storage model so that high speed traversal is enabled and yet those relations are re-assignable. I find it incredibly ironic that the RDBMS is called the “Relational database”, when it does not actually store relationships. Though perhaps the “R” really stood for Runtime Relationship (R-RDBMS) as they store discrete data values which are then used to runtime calculate relationship using set based logic. It’s not hard to see why that leads to performance and scalability issues when you look at the complexity and volume of data in today’s applications. Would be really interesting to see your graph meta models employed over application domain models in a large scale distributed object database like Versant ( this is where I come from ). It would certainly move your work further up the scalability curve shown in the article. It gets tricky when you start dealing with optimization of the network on the implementation of something like Dijkstra on a data set which doesn't fit on a single node. Then traversal algorithms need to be smart about how to load the adjacent set of vertices. thank you for this article. It will be my personal reference node for exploring this subject. I liked the design and the way it works. 1>Can i version this graph. 4>Last but not the least can i export the data in somethign like a xml which is human readeable. Thanks for this post, I’m definitely bookmarking it as a reference. 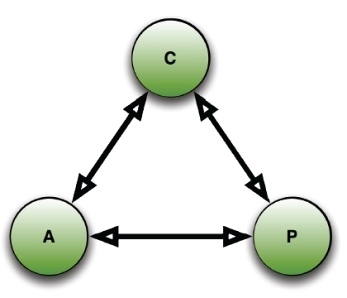 CAP theorem appears however as a surprising introduction to Neo4j. As you pointed out, most NOSQL implementations give up on atomic transactions in order to improve scalability. That does not, however, correspond to my understanding of the approach of Neo4j: on the contrary Neo4j does provide ACID transactional support while causing headaches when it comes to scaling horizontally (sharding). The main difficulty comes from the fact that nodes are highly connected to each other, which renders partitioning of the data set much more complicated that in the case of key-values, columns or documents stores. Thanks for such an unbiased overview of NoSQL DBs. Although article covers mainly graph based DBs. I really liked the way everything is presented here (instead of simply cursing RDBMS). A small delta, I expected more details about graph DBs.